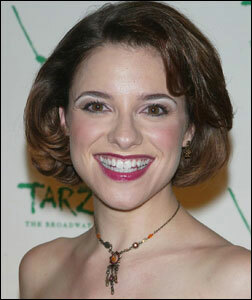 While Jenn Gambatese has already impressed Broadway audiences with her leading roles in the musicals All Shook Up and Tarzan , she's playing it straight -- so to speak -- as Marie, the girlfriend of impoverished painter Jean-Francois Millet (played by Norbert Leo Butz in Is He Dead? , David Ives ' adaptation of a little-known Mark Twain play. "I've been itching to do a play. The fact is I didn't really train for musicals when I was at NYU, so even I'm surprised I've worked so steadily in them. When I first read it, I was a little surprised at how funny it was; I really didn't know what to expect from Twain. But once you work on it, you realize you have to work to make sure the audience finds it funny." Gambatese says playing Marie isn't as easy as it might look. "She has a lot of gumption, but she's also very naive, with this earnest, sweet nature. She means everything she says, and so her comedy isn't right there, the way it is with some of the other characters," she says. "The most important thing is that her love story with Millet has to fuel all the crazy things he does in the play. As our director Michael Blakemore says, you can do as much as you want with this material as long you play the truth." The actress is also finding another benefit in doing a play instead of a musical. "The civility of this process is wonderful for my marriage. I think my husband was more excited about this than I was. For example, it's great not waking up in the morning worrying about how your voice is or how long you can talk on the phone."